Work Place Height Safety—Why Risk It? Tip 4: Work Place Height Safety—Why Risk It? Risk assessments should be conducted prior to any Work at Height, or Confined Space Work being carried out to identify hazards that exist and the risks they pose. 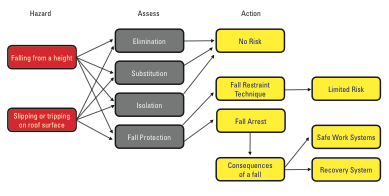 AS/NZS1891.4 contains a Hierarchy of Control which provides an ideal platform for development of risk assessments. Below find sample Risk Assessment Procedure for working at height. Reference to local authorities is also recommended. This table is a sample only as many other hazard factors can and will come into account. Other issues to be addressed at this stage include, but are not limited to: Nature of the work, surface materials, fragile roofing material, personal training levels, competency, weather conditions, surface conditions, etc. Reference should be made to AS/NZS1891.4 for the Correct Use, Selection and Maintenance criteria for Height Safety Systems. It is recommended that wherever possible a 'Restraint technique' system is used. This is a system where a person using fall arrest rated equipment, is prevented from reaching a position from where a fall is possible. Work sites today pose hazards that can cause serious harm. The responsibility to end each day safely is everyone's responsibility, employers and employees. An awareness of the hazards at workplaces allows them to be safety addressed. This principle has been used in many very high-risk occupations for some time, and the benefits have been rewarding with a noticeable reduction in accident statistics. A risk assessment—hazard reduction programme should be used by all working at height. Identification of the hazards is working safely - avoiding injury or death. 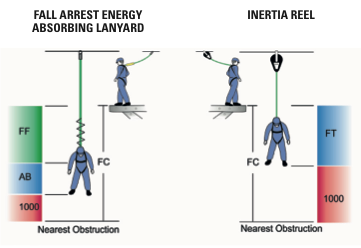 To control a person's movement by means of a combination of a harness and an energy absorbing lanyard that will physically prevent the person from reaching a position at which there is a risk of a free fall. 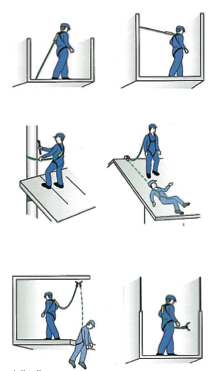 A fall, or the arrest of a fall, where the person suffering the fall is partially restrained by a restraining device such as a pole strap or is sliding down a slope on which it is normally possible to walk without the assistance of a handrail or hand line. A fall, or the arrest of a fall, where the free fall distance prior to the system taking the load does not exceed 600mm. For more information, please ask your local distributor. When using fall arrest type equipment, it is essential that there be adequate clearance under the area of work so that in the event of a fall, the user will not strike the ground or any other hazardous objects during the fall. If it is assessed that the occurrence of a fall would endanger the user then other alternatives of fall protection systems must be considered. This may include the use of shorter shock absorbing lanyards, retracting lanyards or adjustable lanyards. In each case the fall clearance must be identified and the hazards associated with fall clearance eliminated. The benefits of reducing free fall distances are multiple. If the free fall distance is reduced then the load on the system and the person are reduced, also the recovery method may be simplified and time may be significantly reduced. Wherever possible the attachment point for a fall arrest system should be located above the attachment point on the users harness. When this is not possible, the shock absorbing lanyard length must be reduced to ensure that the maximum fall distance of the user is limited to 2m (Consult AS/ NZS 1891.4cl 8.1). A user should never climb above the attachment point using a fall arrest shock absorbing lanyard as this only adds to the free fall distance which may take it over the permitted 2m. AB = Shock Absorber Extension (As per AS/NZS1891.4) can be estimated using FF which reduces FC accordingly. 1000mm standard safety clearance figure. 1000mm standard safety clearance figure. Please note, above representation is a guide and before you use any height safety equipment, please seek profession advice from one of our CSS member stores. Information was provided by Beaver Brands and was structured on or before February 2015.